Ok, so I’ve now got caught up in the Challenge (just) after a late February entry! 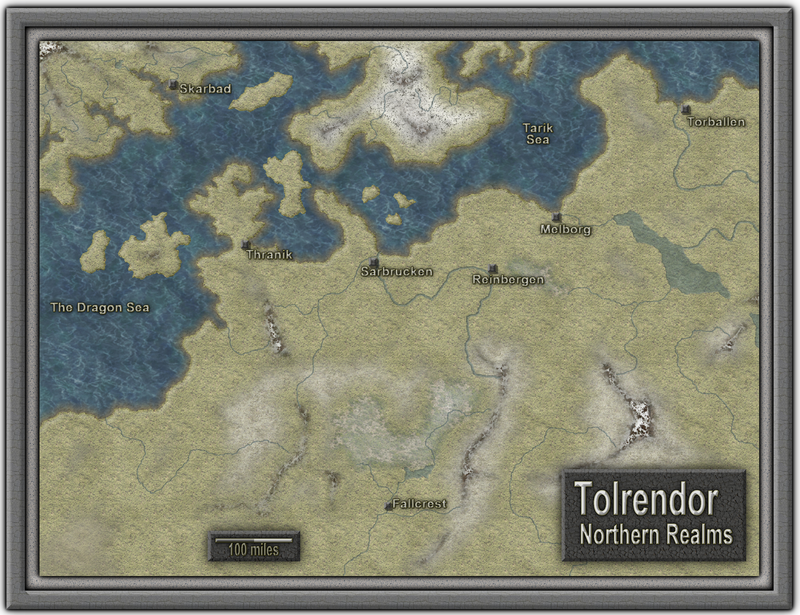 This is a first draft of this region, which you can tell from the lack of place name detail! I have lots of thinking and creating to do before this can be filled in! In the southern-central part of the map you can see the town of Fallcrest, and the Nentir Vale region (from the 4E D&D Dungeon Master’s Guide) which is the setting for the Amber Tower campaign I’m running for my children. The rest of the map is designed to provide a Viking/Medieval Baltic-type setting, with plenty of fantasy twists of course (Like the frost-dragonborn raiders from the fjords!). The Annual style was a good choice for a ‘draft’ map, as it uses bitmap fills for terrain features rather than symbols, making it pretty easy to fill in the high-level detail quickly. The textures and sheet effects are lovely, although I think I’ll need to fiddle about with some of the individual sheet settings to get it just how I want it for a final map. What I really love about this style is the coastline effect, with the bevelled edge of the land blending with the sea – particularly striking where the narrow fjords cut into the northern-most landmass. The textured text and text border is a highlight also! This entry was posted in Cartography, Columns, Roleplaying with Kids, The Amber Tower Campaign, The Annual Challenge, Tolrendor Gazetter, World Building. Bookmark the permalink.